A digital hygrometer is a device that measures the relative humidity (rh). Relative humidity is the amount of moisture that the air contains out of the total amount of moisture the air could hold at that temperature. It is usually expressed as a percentage, with a range of about 35% to 50% being considered optimal. 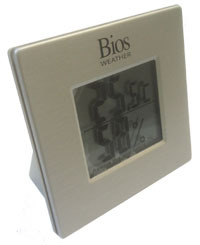 The Bios digital hygrometer provides both relative humidity and temperature and comes in a nicely styled casing. It is designed to fit in with almost any decor and style.